Fuji's Kassen backpack is a great gear bag to have. The larger version is perfect for everyday gym use, while the smaller version is ideal as a kids bag, a backup bag, or for No-gi training. Genuine gi material is used to ensure durability and give a traditional, unique feel. There are three compartments on both versions of the bag. For your big gear (gloves, kimonos, headgear, and belts), there's a drawstring-fastened main compartment. For keys, phones, mouthguards, contacts, etc., there is a zippered front compartment. Underneath the bag is a zippered space that opens all the way up for your shoes, used gear, towels, or other items you might want to keep separate from your main compartment. 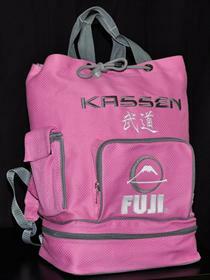 Email your friend about the Fuji Kassen MMA Backpack. Ask a question about the Fuji Kassen MMA Backpack.